Two Years Later, Still Learning From Sandy Hook A new report on the 2012 Newtown school shootings says that school administrators failed Adam Lanza despite their best efforts. The authors say the district had a lack of special education expertise. 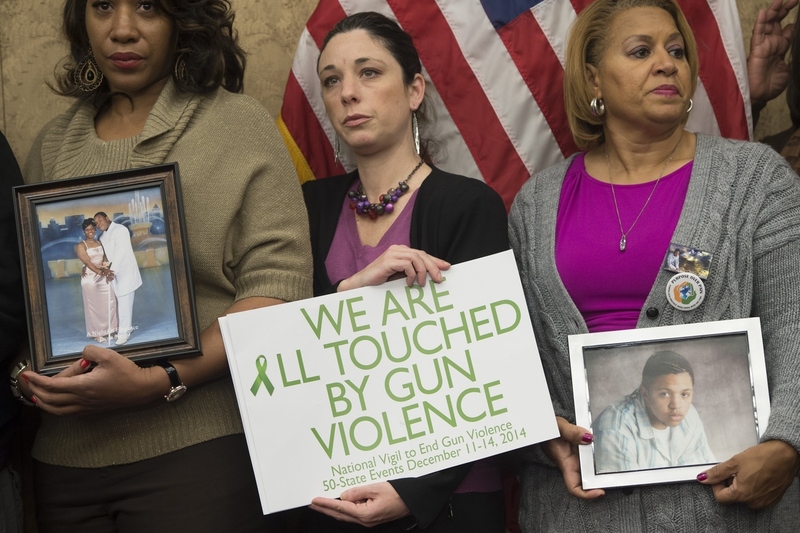 Relatives of victims of gun violence attend a press conference honoring the second anniversary of the Sandy Hook Elementary School shootings in Washington, D.C. on Dec. 10, 2014. It's been two years since a gunman killed his mother at home and then opened fire at the Sandy Hook Elementary School, killing 20 first-graders, six educators and himself. People in Connecticut are still hashing out just how parents and educators should handle children like Adam Lanza. A team of doctors, lawyers, educators and social workers from Connecticut's Office of the Child Advocate issued a report a few weeks ago, and while it says that Lanza is the only one responsible for what he did when he was 20 years old, it also says that there were warning signs and missed opportunities throughout his life. One big concern was a lack of training, knowledge, and expertise. Take Nancy Lanza – Adam Lanza's mother. "Her instinctive course that she set was to get through the day," says Sarah Eagan, the state's child advocate and one of the report's authors. "And you get through the day by managing the day." "And, in some ways, that's a natural instinct," Eagan adds. "She's the mother of a son who struggles to get through the day, who's afraid of everything, who doesn't want to leave the house. ... And her default coping strategy became, 'I just have to get us through.' And ... that kind of infused a lot of the choices that they made." Everyone needs to be more cognizant of the social/emotional aspects of children's development. The report says that, when dealing with school administrators, Nancy Lanza was able to persuade them to "accommodate and appease" her son by avoiding things that made him feel uncomfortable. By the time Lanza got to high school, whether he was learning in school or at home in isolation, administrators had one narrow academic goal: keep moving forward. "I think the school had a goal of helping him graduate and get to college," Eagan says. "That was their goal. It was a good goal." But Eagan says it shouldn't have been the only goal. While the district was satisfied as long as Lanza kept earning credits, it virtually ignored his social and emotional development. In fact, the report says the district mislabeled Lanza in his crucial high school special education plan — entirely ignoring the more apt eligibility categories of autism and emotional disturbance. The district declined an interview. Andrea Spencer, dean of the School of Education at Pace University and one of the co-authors of the child advocate's report, says the schools focused only on his academics and not on the depth of his disabilities. "It appears to me from what we know that Adam was one of those students who slid beneath the radar in terms of his very serious social, emotional needs," she says. That slide should be a real concern for anyone who deals with children, Spencer says. "I guess the lesson that occurs to me is that we have to get and support a broader perspective on children's needs as part of schools, classrooms, teachers, administrators," she says. "Everyone needs to be more cognizant of the social/emotional aspects of children's development." Jennifer Laviano, a Connecticut attorney who represents children with special education needs, says school districts often don't follow special education law intentionally. "I have several clients with not terribly dissimilar profiles to Adam Lanza about whom not only am I worried, their parents are worried, their psychiatrists are worried, and I have gone to PPTs (Planning and Placement Teams) with school districts and said, 'This kid is another Newtown waiting to happen,' and they are telling me, 'No,' when I asked for an out-of-district placement for this child, which is recommended by the psychiatrist," she says. "They're saying, 'No.' And why? Because it's expensive." Spencer says money is a part of it but so are educational priorities. "The degree of emphasis on test scores has the danger of preventing teachers from really looking closely at the breadth of a child's developmental status," Spencer says. "For example, social and emotional skills. And, in this case, it was clear that the focus was really on his academics, and despite the fact that it was very obvious – and people saw – that he was in emotional distress." But what is obvious for Spencer may not have been obvious to everyone. So she says another lesson is this: train educators at all levels to be able to recognize and report a mental health issue when they see one. A previous Web version of this story incorrectly defined PPTs as Pediatric Physical Therapy services. In fact, PPTs stands for Planning and Placement Teams.